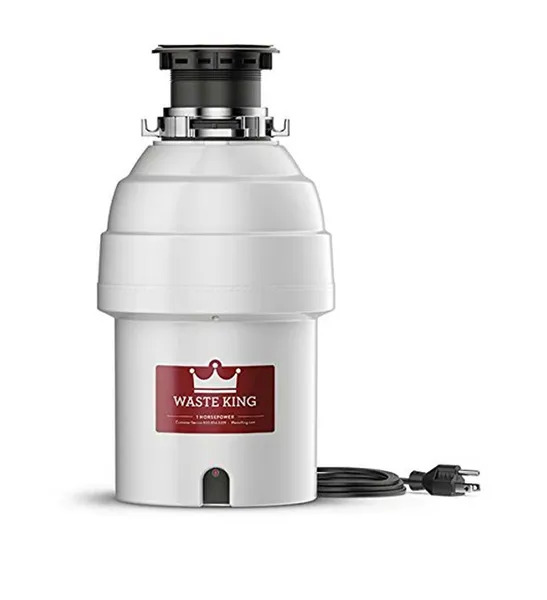 Although there are now many manufacturers, when you talk about garbage disposals, the name Waste King cannot pass unnoticed. Next to Insinkerator, the company is a major and arguably most popular brand on the market. The Waste King L8000 has been one of the most successful products of the Waste King Legend series, and is now one of the best food disposers of this year. Considerably inexpensive yet with a strong motor and quality materials, the model is one fierce competitor in the medium-price range. Let’s take a closer look at this baby. The motor is the biggest difference between Waste King and Insinkerator. With a strong and fast permanent magnet motor instead of induction motor and a grind chamber of 100% stainless steel instead of galvanized steel, it’s hard to believe the L8000 is not more expensive than it has always been for years. Permanent magnet motors are the perfect choice of motor for garbage disposals. They make less noise and are much faster than induction motors. Particularly in this case, the 1 H.P motor featured in the L8000 can reach 2800 rpm. The high rotational speed is useful when it comes to grinding soft remains and avoiding jamming. The fact that the motor is 1 H.P (750 W) is also of great help. 1 H.P is remarkably strong, if not the strongest, in comparison with the available home-use options out there. To put things in perspective, a 1 H.P garbage disposal can handle the food waste produced by a family of 7. In addition, hard food waste like bones, rinds and cobs is no challenge. A casual session normally takes less than 5 minutes (that includes garbage from both meal prepping and post meal), depending on the type of food you’ve had and the number of people at the table. You might catch the motor slowing down when it’s processing hard waste but do not be alarmed. It’s just the machine spending more power on torque instead of speed. But it’s suggested to toss hard waste in the trash to save time. Personally, I often throw the big pieces into the bins and leave the small remains for the machines. On to the grind chamber. The three main parts – the turntable, the impellers and the grind ring – are made of stainless steel, the optimal choice of metal material for home uses. Needless to say, rust won’t be a problem and the chamber will be functional for a long time. That being said, it’s good to keep a routine of cleaning the interiors of the machine. While the parts are corrosion resistant, buildup from food could hinder the chamber’s sharpness. There was a problem back in 2017 where 146.000 units of garbage disposals from Waste King, Moen, etc. had to be recalled because of a particular piece in the chamber of these units that could break off and cause hazard. However, the incident was dealt with quickly, with 100% no-hassle replacements. At the Waste King Legend Series L8000 range of price, it should be understandable that no specialized soundproofing tech is featured. The cost for a machine with sound insulation layers or anything of the sort is usually over $150-200. So, yeah, noise is still a thing for the unit even though in the description it’s written to be sound insulated. Compared to the Badger 5 from Insinkerator, it’s not that much quieter than I initially expected it to be. I’m not saying that they’re both equally noisy. It’s just that if the Badger 5 is a 10 on noise level, then the L8000 is probably an 8. Here’s the thing: complaints about the unit getting jammed up is astonishingly LOW. That is why I prefer the Waste King L8000, especially at this price range. For a machine around $100, jamming is to be accepted. We encounter it, deal with it and we move on. Frankly, I myself haven’t enough time with the machine to be a judge in this matter. However, digging through forums and customer reviews, the remark about a jamless motor seems to be holding true. To be completely honest, it makes sense. A 1 H.P motor which spins 2800 revolutions per minute at peak speed doesn’t leave much chance for jamming to occur, unless you deliberately try to test the unit’s limit. Then again, as few as these feedbacks on jamming are, the thing is not perfect. It WILL jam, for it’s only a machine; and machines act up from time to time. But we’re certainly glad that the frequency of such incident is low. All said, the true key to keep garbage disposals off jamming is the owner’s mindful selection of garbage and the routine maintenance. Keep that in mind. Okay, straight off the bat: the Waste King L-8000 is huge. I mean HUGE. It can easily be one of biggest units of in-home food waste disposer on the market. Of course, it’s logical. A 1 H.P motor is a strong motor and a strong motor is usually bulky. That means the case also needs to be thick and large to house it and protect it. So, if you’re planning to bring one to your kitchen, please take the size of your base cabinet into account and make sure that there’s enough space for the machine. Here’s the detailed specs of the L-8000. One way to tell that the Waste King Legend Series L8000 is a quality product is how Waste King warrant the model with a Lifetime Limited In-Home Warranty – the longest warranty of the whole industry. It might sound insignificant until you’ve understood that garbage disposals are the type of appliances that could suffer from numerous accidental malfunctions. Of course, a company can be evasive sometimes. But that doesn’t seem to be the case considering the number of satisfied consumers all over the place. The Waste King Legend Series L8000 is overall a fine machine and would be a great purchase. Apart from the no-exterior-unjam-mechanic thing, its price and features are something too much of a catch, which does seem little suspicious. Regardless, with a variety of compliments and scarce negative reviews, it should be enough to put doubts aside and give the model a try, specifically with the price (under $130) it’s offering. At the moment for some reason it’s priced at $150 on Amazon. In the past it’s always been about $105. That’s why it’s confusing to read this article right now about it being a good value when it’s not right now on Amazon. But you can still find it for closer to $100 on eBay and other sites. Hey David! Thanks for hanging around and leaving a comment. It’s like that on Amazon sometimes, I admit. The price is back to its regular now by the way, which is under $130. Recently, the Waste King Legend series have undergone some sort of upgrade. I’m sure you’ve noticed the new casing of the series. Maybe that’s the reason why the pricing went a bit haywire.